Olof Mathé is the CEO and a co-founder of Mixmax, a company that is “bringing the power of the Web to email” by creating richer email experiences with embeddable Slack-style commands to trigger polls, video, calendar invites, and more without leaving the message. Mixmax was founded in 2014 and received a $1.5 million seed investment round from a number of individual investors in April 2015. After finishing his engineering degree in France, Olof previously worked at Skype and McKinsey. He also helped grow Inkling Habitat, a cloud-based authoring environment for writers and publishers. Whether you are marketing a business or consumer facing product, it’s likely that you are providing an opportunity that dramatically alters a process or workflow instead of replacing an existing product. I think that’s a challenge every entrepreneur has. You’re inventing something new. You’re building something that perhaps didn’t exist before. Most apps that launch are like some kind of stand-alone product. That just introduces a lot of overhead for the user or the buyer of the product because they have to recognize this thing and start using it as a stand-alone product no matter how awesome it is. In this case, it’s essential to do everything within your power to fit into the existing workflows or processes of your target audience. This is especially true when introducing new technology or a new concept that had not previously been considered. A central component of advertising personalization is providing your audience with the right solution to an immediate problem at the exact moment they are experiencing that pain point. The other thing that we’re really excited about with regards to Facebook ads, and we think about this kind of holistically, even when it comes to how we think about Mixmax as a product is. As you’re talking to people in other organizations or, as it is in this case, people who are trialing your product, how do you get them everything they need during their trial to be successful? And so we all know that people spend a ton of time on Facebook, actually incidentally especially when they’re at work… It would be silly for us not to offer them the kind of resources they might be looking for while they’re also on Facebook, right? A product that improves on professional communication is best advertised or introduced while the target audience is at work. Even during standard non-work hours, advertising professional tools can match the immediate needs by creating messaging more relevant to an off-hours context. It’s easy to take for the granted all of the many the tools, technologies, and experiences that use and encounter daily as professionals and consumers. Sometimes, no matter how powerful the new features or value proposition are, adopting a new product is simply replacing one stale solution for another. This goes to the core issue of email as a medium being so dry. How can you send a message that really engages someone? A wonderful way, as an example to engage someone is embedding a video in a message. That’s trivial to do; you can do it with a slash command in Mixmax. The video will play directly inside of the message and you can embed a whole other host of rich media, be it articles, surveys, polls, gifs, you have it… Not only does it actually look better – so it’s more eye-catching – but it actually has real meaning. Creating a rich and fun experience beyond quality aesthetics and an intuitive user experience is an excellent way to break through the noise whether engaged in cold outreach, or finding your product market fit. Ander: It’s not every day that I try a new SaaS product, a new tool, platform, or whatever else you might call it, and it completely changes my workflow and the way I do things. That happened when I started using Mixmax about a month and a half ago. Today, I happen to be sitting down here with the CEO and one of the cofounders, Olof Mathe. He came over here from their office, which I understand is just around the corner. Thank you so much for taking the time to be here, Olof. Olof: Thanks for inviting me. Ander: Absolutely! I think the best way for us to start is to hear about Mixmax in your own words – I explained it a little bit in the introduction… What is Mixmax? Olof: We like to think about it in a number of ways – the future of communication, a platform for all of your external communication, and above all, a way to kind of automate away all the tedium that you have in your life, so literally you don’t have to spend any time on admin. Ander: What’s an example of what that literally looks like? Olof: A really common thing for when you want to do a podcast, is you want to figure out a good time to record a podcast and meet people. Typically, in a pre-Mixmax world, the way that worked is you would look at your calendar, switch a tab to your email, jot down a couple of times that might work, hope that those times work for the other person, and you engage in this interminable back-and-forth. Just a sheer waste of time. Ander: I think we’re all familiar with that. Olof: Yep. Dreadful, right? A complete waste of time because what’s valuable is being here with you and talking with you. That’s a meaningful interaction. The kind of admin of setting up that meeting is not. With Mixmax you can just, actually in a keystroke, embed times from your calendar. When a recipient taps on one of those times, the meeting is automatically set up. There is zero back-and-forth and suddenly you get all of that valuable time back. Ander: And that’s just an example! Also it’s all done with a slack command style type thing. Ander: I sent you a map to give you directions how to get here with the same sort of command. So needless to say, it’s saved me a bunch of time. It’s a really cool product. And I think the next best thing to hear would be how you got there, what you were doing before this, and what inspired the idea for Mixmax. As co-founders – and this goes for everyone in the company – we’re absolute communication geeks and our broader mission at Mixmax of course is to make your communications much more expressive and make you much more effective at what you do at work. The original impetus was this really long-standing frustration with the communication devices we have, particularly when we’re trying to talk to people outside of our team. Inside of your team here at Instapage you probably use Slack and Google Docs and task managers and it’s really awesome because everyone’s on the same platform and you have access to all this awesome stuff. The second you want to talk to someone outside of your team, typically you have to revert to email, which is the lowest common denominator protocol, which typically is kind of like plain text and drab and boring. But what’s wonderful is email doesn’t have to be this way. Email can be rich and engaging and interactive. And that’s kind of where we started out because email’s kind of the bane of everyone’s existence, and it can be fun and effective and just help you do your job better. That was the real impetus to Mixmax. Ander: And where were you before Mixmax? Olof: I was at another startup called Inkling where I also met my co-founders. We were kind of product design and engineering leads where we built a product that’s kind of what Google Docs is for the publishing industry. We started the company two and a half years ago and the product’s been live for two years. Ander: Awesome. When you first started Mixmax, what were your growth and your marketing philosophies? What did you think you and your team were going to need to do to get the word out about what you were building? Olof: Nice. I think we were impossibly naïve. Haha. We’re all incredibly product-focused people. That’s kind of wonderful because to some extent that prophecy or that kind of philosophy has held true for us, which also means there’s a lot of low-hanging fruit which I’d love to touch upon later on. Ander: Yeah, sure. That’s a very unique situation – building it and having them come is not something many companies can say they do successfully. Olof: Yeah, and I think that’s partly for a couple of reasons. One is, obviously, we’re a communications product. So communications products by their nature have some degree of virality built in, right? Olof: If you’re building some HR product, the likelihood is you have, like, zero virality because you know… t’s HR. We’re pretty lucky there. I think there’s another aspect, and this kind of goes to kind of the core of Mixmax when we started the company too. The growth goes to the kind of richness and expressiveness of what you can do. So as you mentioned, messages sent with Mixmax, emails sent with Mixmax, are just infinitely richer and more notable than other emails you might get and receive. So, there is some degree of inherent virality in the product that way, even though that’s just a tiny part of what the product does overall. I think that’s helped as well. Ander: So, your philosophy I guess when you got started was ‘build it and they will come.’ Obviously to a very strong degree that is true and it’s been working so far. What are some of the other things that you’ve noticed have really assisted in you guys breaking through the noise the way that you have? Olof: Yeah. Another interesting aspect for that is making sure that your product integrates with someone’s existing workflow. I think that’s a challenge every entrepreneur has. You’re inventing something new. You’re building something that perhaps didn’t exist before. Most apps that launch are like some kind of stand-alone product. That just introduces a lot of overhead for the user or the buyer of the product because they have to recognize this thing and start using it as a stand-alone product no matter how awesome it is. In our case, and this was kind of the very first version or product that we launched, was launch Mixmax as a Chrome extension, which is still part of the core Mixmax experience in many ways. Of course you use the Chrome extension as well. And what’s beautiful about that is we could integrate with people’s existing workflow within Google Apps. And now also within a host of other apps. We integrate with Salesforce through that extension as well. It just meant that we’re building on an existing workflow that people have so the learning curve or adoption curve is very low. Ander: Mm-hmm. Are you engaged in any sort of digital advertising or any sort of paid media? What other channels do you guys find work for you? Olof: So… I was about to say we don’t do any advertising at all. But we actually just started some Facebook ad experiments. Olof: But up until literally two weeks ago, we had done nothing. And still, our budgets on Facebook are pure test budgets just to test the terrain and see what kind of numbers we get from it. Ander: At this stage where Mixmax is at right now, what’s something you’re hoping to learn from Facebook? And, what inspired you to start running those tests? Olof: Which is, of course, absolutely not the case. It just so happens that we have someone on the team who’s done Facebook ads before so we said, awesome, let’s kind of use that skillset and try it out. And Jeremy on our team is kind of not as much a fan of AdWords as a platform so that’s kind of personal preference which, of course, is grounded in his experience and his data that he’s seen in the past. But there are a couple of reasons we’re excited about it – The first is that t would be stupid not to try or do paid advertising because there’s so many marketing levers that we haven’t even experimented with. It’s actually a big focus for us to expand our marketing toolkit. The other thing that we’re really excited about with regards to Facebook ads, and we think about this kind of holistically, even when it comes to how we think about Mixmax as a product is. As you’re talking to people in other organizations or, as it is in this case, people who are trialing your product, how do you get them everything they need during their trial to be successful? And so we all know that people spend a ton of time on Facebook, actually incidentally especially when they’re at work. Haha. Ander: Haha. That’s no secret! Olof: It would be silly for us not to offer them the kind of resources they might be looking for while they’re also on Facebook, right? It’s just a way for us to help them be successful with their trial. Ander: That’s interesting because I’ve talked with a lot of people about Facebook ads. It’s something I think about a lot and I talk about in many of the webinars that I do here at Instapage. Incorporating those ads into onboarding in some sense, or the education of your target personas, is an interesting use case. Especially with how it seems like you’re describing it. Olof: Yep. We’re really excited about this approach actually. We think about it a little bit less in terms of, ‘Hey, we’re going to get a cold audience on Mixmax,’ and use ads that way because of course the costs would be much higher as well. Olof: The way we like to think about it is purely in the trial sense. So when we have folks that start a trial, how do we increase the conversion rate through ads? And above all, our current philosophy is, making sure we get people the kind of resources they need to be successful, because no matter how much we might be, you know, prompting people with in app chat or marketing automation by email or other channels, there this other channel where people spend a lot of time. It’s a great way to kind of help them along the way. Ander: So it seems like what you’re saying with a few of the things you’ve mentioned so far is something that we really relate to at Instapage. One of our philosophies, for lack of a different word is, ‘whatever your marketing stack is, it’ll work,’ you know? Ander: It seems like with that, and proactively providing people with what they need and making it easy for people to start using a product without having this barrier of entry is something is very important to everything you guys are doing. Olof: Yeah, that’s 100% core. And I think we have a ton of work to do in this domain, so obviously, as we speak about this, part of it’s also aspirational, right? Olof: A big marketing challenge for us is actually producing kind of the collateral – for lack of a better word – that helps our customers be more successful. Ander: What kind of collateral is that? And that kind of ties into my next question about what is going on with email as it relates to the marketing efforts within an organization. Olof: Woah… big question! Haha. Ander: That’s exactly why I asked it! Olof: So perhaps I’ll just tie that one down a little bit… Such an unruly beast there. Olof: There are couple of things that I’m personally really excited about. One, of course, is personalization and the other one is – not to be too jargony – is increasing the collaboration between marketing and sales in a deeper way. 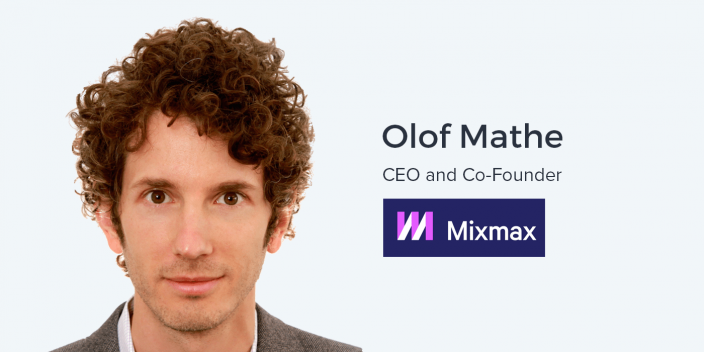 Olof: One thing that’s kind of beautiful and something that we’re really excited about since it’s a core focus of Mixmax is how can you, to a maximum extent, personalize the way you interact with customers? So the Facebook ads are actually a pretty good example because we hook it up to analytics they’ve done in the product. If people have been using our sequences, or setting up a lot of meetings, but perhaps have not used reminders and understood how they can use those to never miss a follow-up, for example, will perhaps prompt content that’s related to that in their overall journey for ads. And likewise, anyone who is kind of a warm lead on the trial and is very likely to be a high-value customer, we automatically route them on very high-value sequences that are actually completely customized with liquid markup. Olof: So they get highly customized messages but we actually don’t have anyone writing these – don’t tell anyone! Haha. Ander: Haha. By the way, can you explain those sequences? Just to have some context. Olof: Yeah, absolutely. Sequences are our powerful workflows within Mixmax. There are so many workflows that we have today that could be automated but they aren’t automated. A beautiful example in Mixmax is as a new trial user you sign up, and based on your characteristics as a sign up, you’re very likely to buy, so we put you on kind of a mixture of an automated drip campaign and other touch points within the product. We actually don’t necessarily interact with you in person until you’ve scheduled a meeting through Mixmax and it ends up on our calendars. Ander: But I would never know that. Olof: But you would never know that. Olof: And my guess is you probably wouldn’t care, either. Ander: Well, that might be true but as a marketer, I appreciate when a company is taking the effort to engage in that level personalization. One of the things that I spend a tremendous amount of time talking about here at Instapage is advertising personalization, and marketing personalization in general, so even though I see emails and I recognize that there is obviously some AI behind this or there’s some sort of automation that’s built into it, I am aware that this company has me very segmented and they’re going to be treating me appropriately based upon my needs. This might be something that only marketers are really going to be thinking about but I think that as people get more educated about the technology that’s out there, this will still be appreciated. Olof: Absolutely. And I think the beautiful part of this is if whatever product you signed up for is actually a really good fit for you, you will get the most personalized experience on the planet which is talking to a live human. Olof: Yeah. So it actually helps, in a way, route you to that. Like the 100% personalized experience which is the human interaction that we’re having now, which is all where we want to end up. I’m not sure cold calling is dead. I think that with the right approach you can be proactively getting in touch with leads that might not have that brand awareness that you desire ideally. What are you seeing right now going on in that space and how Mixmax is changing that? How are people approaching the concept of a cold outreach for a sale or partnership opportunity? I think it’s a little bit probably more about how you approach someone in the cold outreach per se. There, a couple of things that we get really excited about actually, particularly for cold outreach. One of the things that we love and we spend a lot of time thinking about at Mixmax is not only, of course, how can we make outreach based on inbound better, but also how we can make cold outreach much more just interesting and compelling to receive. This goes to the core issue of email as a medium being so dry. How can you send a message that really engages someone? A wonderful way, as an example to engage someone is embedding a video in a message. That’s trivial to do; you can do it with a slash command in Mixmax. The video will play directly inside of the message and you can embed a whole other host of rich media, be it articles, surveys, polls, gifs, you have it. Now, what’s beautiful about this is – pun intended with the word ‘beautiful,’ by the way – Haha. Olof: Not only does it actually look better – so it’s more eye-catching – but it actually has real meaning. So if you’re trying to tell the story of why Instapage matters, in your case, perhaps you can embed a customer testimonial around how Instapage was transformational for some company. Just that simplicity of response, which is just a tap versus hitting ‘reply’ and typing out some long message, you will 3-5X your response rate just with that. Olof: And it’s beautiful because it updates the field in Salesforce, you know that this lead is actually not dead but that you’re just wrong in timing. And half of success is just showing up at the right time. Olof: So it’s awesome if you can just have that response actually mean that they get queued up in another drip campaign to start in, you know, three months or something like that when they’re ready. Ander: It’s really interesting that you mentioned creating this richness out of something that is very often very stale. I think that there are so many new ways to do things – and I say that in a very broad way – that I think that a lot of the magic sometimes disappears. Email is in no way a novel thing anymore. When I got my Hotmail account for the first time way long ago, it was something different. But simply adding some more flavor to an experience is actually a very powerful brand and marketing technique. That’s really, really interesting. We only have a couple of minutes left, so I’ve got a few more questions I want to ask you. What do you see in general as the future of advertising, the future of marketing? Where is all of this going? And there’s no right or wrong answer here. Olof: Yeah. So many different angles to explore there. One thing obviously I’m really excited about, which I touched upon earlier, is kind of thinking about ads less as a medium to get completely cold users and more as yet another way to push someone down a purchasing funnel. And kind of what we spoke about, about how you get people more engaged in the trial through ads in good ways, which is a great way to use content marketing which everyone knows that you can get better results from content marketing versus ads on Facebook. Olof: That’s one piece. The other piece is rapidly personalizing outreach to even hundreds of people. Liquid markup is one way, but a lot of the existing legacy tooling that we’ve had for drip campaigns hasn’t enabled us to add a personal touch in a really rapid way. This is something we’re driving at Mixmax where perhaps you have a hundred people you’re reaching out to. In five minutes you can flip through every single message and add some personal flourish to each of them. It’s something we’re big believers in. Olof, it’s been a pleasure having you in our office. Thank you so much for taking the time out of your day to take the short walk over here. I have one last question for you. As marketers, as everyone who’s listening to this episode, what can we do to help you out? What can we do to help out the marketing community as a whole? Olof: Haha ok. Well, actually, I’ll start with the non-self-serving thing. Olof: First thing, overall I’m excited about… I think this podcast is actually a great example because I’m really excited about knowledge sharing broadly in the community. Olof: And I’m also really excited about… for example, there are some spaces in San Francisco – for example the SaaStr space that kind of focuses uniquely on SaaS companies and marketers to get together and work out of similar spaces and kind of cross-pollinate and share learnings. I get really excited about that. It’s interesting that you guys share an office with Prezi although your businesses are very dissimilar. Olof: I’m sure there’s some kind of cross-pollination there. Ander: Yeah, we’re friends and talk fairly often. Olof: Yeah, and that’s actually what I think is one of the beauties of being out in San Francisco even though everything is ridiculously expensive. You have a higher likelihood of really interesting cross-pollination, so the more focused communities that we can create or spaces for people in marketing or sales, the better. And, the kind of self-serving piece, which probably answers your question directly, would be we’re incredibly excited by working with more marketers and building up with our marketing and our sales team. So if you’re a marketing pro or a sales whiz and are interested in creating the future of communication, feel free to reach out to us at Mixmax, careers at Mixmax. Ander: Awesome. Olof, once again, thank you so much. Awesome conversation. And I’m sure we’ll talk soon. Olof: Awesome. Thanks so much, Ander. Have a good one.